In the diagram above, the celestial sphere is drawn in the plane of the observer’s meridian with the observer’s zenith (Z) at the top. Z represents the observer’s zenith. A is the point where the virtual circle running through the position of the celestial body meets the celestial horizon. The Zenith Distance. The Zenith Distance is the angular distance from the zenith to the celestial body measured from the Earth’s centre. It is the angular distance ZX which is subtended by the angle XOZ and is measured along the vertical circle that passes through the celestial body. (A vertical circle is a great circle that passes through the observer’s zenith and is perpendicular to the celestial horizon). 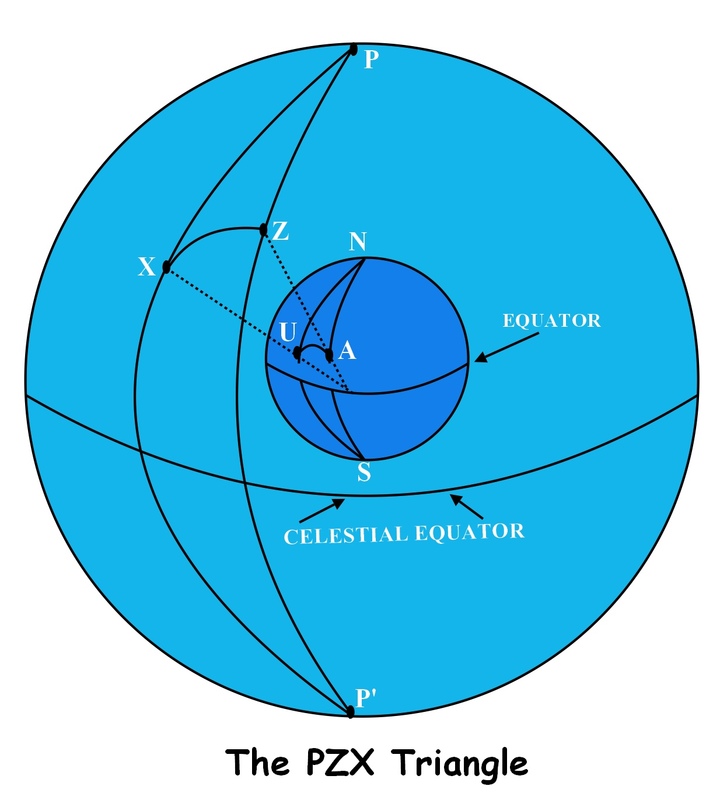 In the PZX Triangle diagram which is shown below, the arc AU is the arc joining the observer’s position to the geographical position of the celestial body. This arc when projected onto the celestial sphere forms the arc ZX which is the zenith distance. Therefore, from the discussion above, it can be seen that the angular distance ZX is equal to the angular distance AU which when converted to nautical miles will give us the distance from the GP of the body to the position of the observer. Azimuth. The angle PZX is the azimuth of the celestial body and is the angular distance between the observer’s celestial meridian and the direction of the position of the body (GP). 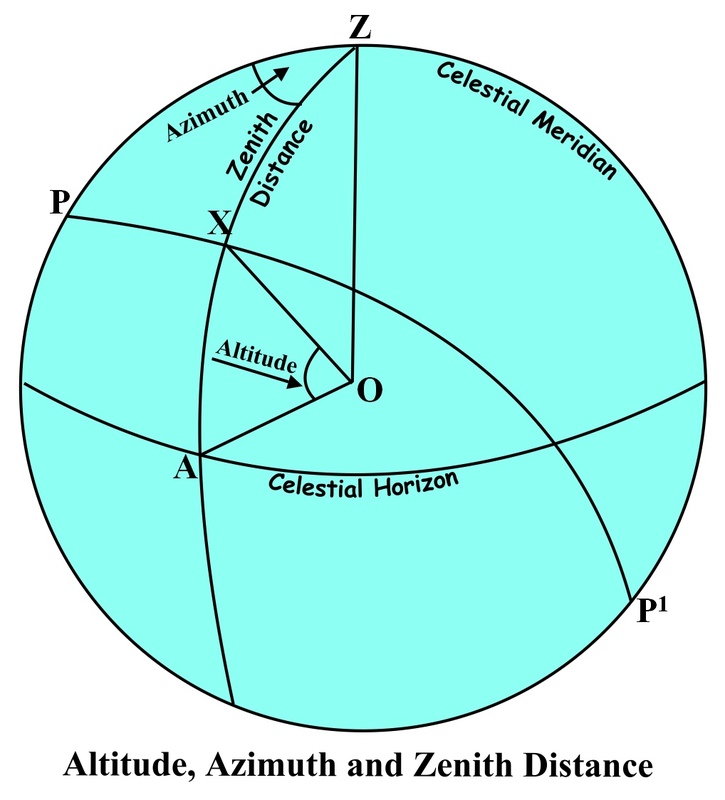 Summarizing The Role Of Altitude, Azimuth And Zenith Distance In Celestial navigation. The preceding discussion illustrates the importance of altitude and azimuth in celestial navigation. It can be seen that by measuring the altitude of a celestial body, we are able to easily calculate the zenith distance which will give us the distance in nautical miles from the observer’s position to the geographical position of the body. The azimuth will give us the direction of the GP from the observer’s position. This explains why measuring the altitude and azimuth are the first steps in determining our position in celestial navigation.